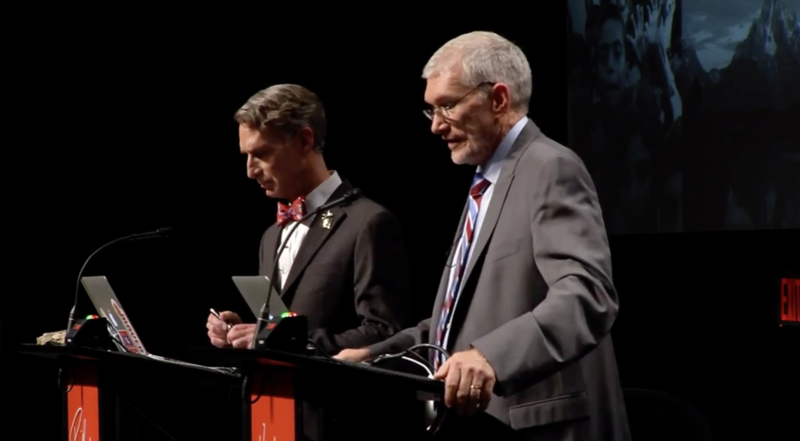 Ten days ago Bill Nye (yeah the Science Guy) debated Christian author Ken Ham about evolution vs creationism. Their live-streamed slugfest is a social media lovehug (for the sharing) and fistfight (for fierce debate). I see posts supporting one or the other, or neither, still several times a day. On February 12, just for fun and to show some stories have long shelf life, I posted on Google+ link to my August 2010 news bit “Darwin was Wrong“. It’s not a creationist rant. Research published in Biology Letters produces compelling evidence that dispels one of Darwinian Theory’s foundational premises—that evolution depends on competition as driving force of change, and the fittest survive when competition for living space, food, and other resources increases; it directly relates to concepts of natural selection, too. The researchers identify something more dramatic, and I say more sensible: Increased availability of living space and other resources allows biodiversity to naturally occur. “Living space” theory is brilliant and explains phenomena observable today. I say this as an ordained bishop, the creationist was and is an absolute idiot. Statements like his belif the Earth is only 6,000 years old is lunacy. He needs to go study biblical archaeology. For that matter, so does Nye or admit he’s practicing the religion of Atheism. I agree: “Nye has a religious agenda, too”. “Saying Atheism is a religion is like saying that not playing hockey is a sport”, Stephen MacDougall retorts. Fervent belief and active evangelism are shared qualities. There’s no proof either side is right. Maybe our universe is in some petri dish somewhere—vast to us, but small to a deliberate or accidental creator. Human beings don’t know enough about anything really related to the origins of our existence. Yet so-called creationists and evolutionists assert that they do. As for further definitions. Look at Apple and words used to describe loyal fans—’Mac Faithful’; ‘Second Coming of Steve Jobs’; ‘The Jesus Phone’. Religion isn’t just a belief system but a way of living. Human beings worship. For some reason we seek to attach ourselves to something or someone that will raise us up. God. Movie actors. Musicians. Pick a category. In process we revel in them and ignore their faults. We love them, which is appropriately observed on Valentine’s Day. That’s the problem with the Nye-Ham debate. There really is none. Each man is a dogmatic evangelist for his belief system, and there’s a fantasy-world reality to both. Dead man Darwin is more evolved than this.